It is spooky to traverse through the simulated reality of the psychological thriller Transference, but it feels like countless spooky experiences I’ve had before. Scientist Raymond Hayes has created the means by which a human consciousness can be uploaded to a digital simulation. To test his experiment, Hayes uploaded the brain data of himself, his wife, and his young son. Predictably, this alternate reality goes haywire, and players must enter this glitched dimension to discover the fate of the Hayes Family. If you’ve played any of the exploratory adventure games of the last few years (often derisively known as “walking simulators”), then Transference will feel overly familiar, a bit like Soma, Gone Home, Layers of Fear, and P.T. mashed into one. You see the game world in a first-person view. You interact with objects and find video logs that will provide background information and provide some puzzle clues. You walk down hallways, figure out how do open locked doors, and solve a mystery. You’ll encounter a few scares along the way. The most unusual feature is the mix of live-action footage in computer-generated environments. The story, too, is filled with recognizable tropes: A brilliant, eccentric man doesn’t feel recognized by the world at large. He becomes obsessed with his work and neglects his family. His wife gives up her career to support him and regrets it. His growing mania puts everyone in danger. Disappointingly, it hits all the same old beats and plays out as you’d expect it to. There are some touches that make escaping the Hayes apartment a challenging experience. There are essentially three versions of the apartment, each tied to the consciousness of a family member, and flipping light switches allows you to change perspectives on the fly. The item that you need to solve a puzzle in the son’s bedroom might be found in the dad’s version of the kitchen. You have no inventory and can’t simply carry items until you need them, so you need to remember exactly where you spotted that certain something. Although the layout of the apartment doesn’t change, the three realities feel like glimpses into three distinct consciousnesses. Puzzles are often presented as missing data. Solve the puzzle, clear the glitch. The sound design is a highlight, as whispers, knocks, growls, and other requisite horror noises come from all around you. A glitched-out monster-looking thing makes a few appearances, and while the experience should be a terrifying one, you’re not really in any mortal danger. This lowers the stakes completely, much to the game’s detriment. Like Layers of Fear, it feels as if Transference has a story it wants to tell and you’re just along for the ride. 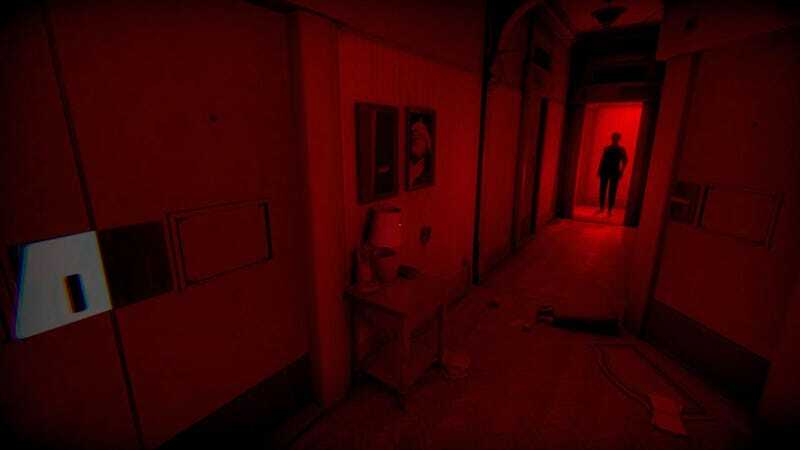 As a collaboration between film production company SpectreVision and developers Ubisoft Montreal, Transference is presented as a cinematic game what with its brief runtime (about two hours) and Roger Rabbit-style blend of live-action footage and standard game environments. In the framing narrative, Raymond Hayes (Macon Blair) addresses you directly and explains the situation, and the experience is akin to watching a videotape. Once inside the simulated apartment, you’ll find genuine photographs and video footage of the Hayes family. While this is supposed to make you feel like a real person interacting with an actual alternate reality (a sensation heightened if you choose to play Transference in VR), it still comes off as goofy as an old full-motion-video game. There’s no doubt Transference is an interesting world to inhabit for a little while. Puzzles will keep you on your toes, running the gamut from “find the key” to a few head-scratchers. The colors and glitch effects are terrific, reinforcing the idea that you’re in a simulated reality. Ultimately, though, the superficial trappings of the game aren’t enough to transcend the overall feeling of familiarity and make it a totally unique experience. Stacie Ponder is a writer, artist, gamer, and swamp hag best known for her long-running horror blog Final Girl (www.finalgirl.rocks) and her love of pizza.